For most users one of the hardest things is figuring out which files actually need to be backed up on a regular basis. We often come across machines that are having backup errors when System Files and Folders are selected to be backed up as part of a "Full Backup". Keep in mind that if you have any real-time Disaster Recovery solution in place it may interfere with backup programs designed for long-term data retention. As these services are performing constant data replication they would need to be stopped during file backups for other programs to utilize some shared services. Let's take a look at what we mean with our terminology "Full Backup". "select everything then I will have it later"
"backup all of the selected files"
"backup files that have changed since the last Full Backup"
The objective for most users is to back up your personal files from your personal computer, not system files, applications, or server resources. We don't recommend adding these files to your backup selection because they can interfere with the backup of your personal files. These types of files often have complex requirements and relationships to other files, so it's often useless to restore them. These are files that your computer needs to work correctly. They may be a part of your operating system, a third-party device driver, or another source. Typically, you don't interact with these files directly, your operating system does. These folders contain the files that allow various applications - like your email, word processor, and web browser programs - to work correctly. 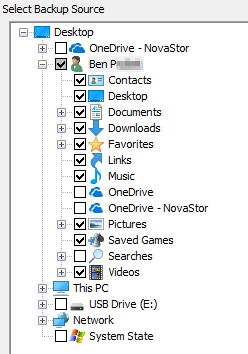 Like system files, you don't typically interact with these files directly, but your programs do. We would recommend that for most users, select only the folders you know you need to backup. Typical folders would include your User folder (previously known as "My Documents"). Note: The AppData folder referenced later is included in this selection by default if it isn't visible. ".PST", or Personal Storage Table files, contain a user's Outlook data for POP3, IMAP and web-based mail accounts, including all mail folders and the items within the folders, such as emails, email attachments, to do items and appointments, contacts and more. These files were used in versions of Microsoft Office Outlook 2000, 2002, 2003, 2007 & 2010. Outlook Data Files (.pst) created by using Outlook 2013 or Outlook 2016 are saved on your computer in the Documents\Outlook Files folder. If you upgraded to Outlook on a computer that already had data files that were created in Microsoft Office Outlook 2007 or earlier, these files are saved in a different location in a hidden folder at C:\Users\%UserName%\AppData\Local\Microsoft\Outlook. The offline Outlook Data File (.ost) is also saved at C:\Users\%UserName%\AppData\Local\Microsoft\Outlook. Most data remains on the server; however, any items that are saved locally should be backed up. For example, Calendar, Contacts, Tasks, and any folders marked Local only. See How to locate, move, or back up your personal folders (.pst) file in Outlook and/or Introduction to Outlook Data Files (.pst and .ost) for more information about these files. We do not recommend using File-Based Backup (i.e. the Backup tab) for System Files and Folders. Note: Excluding the AppData folder is up to you, as it contains highly system state dependent data, this is also a Hidden Folder by default. To see this folder in the file tree you need to show hidden files in Windows Explorer. Cloud synchronization folders (Microsoft OneDrive, Google Drive, Amazon Cloud Drive, and Dropbox, to name a few) are not normally desired during a File Backup, as they have version history available online when they are synchronized to/from your local machine. Don't forget to make an Image Backup! We recommend utilizing the Image Backup feature of NovaBACKUP for your "C:" drive to backup System Files and Folders.